Laurus nobilis, also called the Grecian laurel or the bay laurel, is a drought- and disease-resistant tree that is popular for landscaping and also for privacy. However, while this tree is low-maintenance and relatively hardy, there are a few diseases that can cause problems for it. Knowing how to recognize and react appropriately will help you get the longest life out of your Laurus nobilis tree. Laurus nobilis tend to be pretty disease-resistant, so you will have to look closely if you want to spot trouble early. Look for leaves that are yellowed during spring and summer, as well as for discolorations and mushy spots on leaves, branches and bark. If your tree is showing signs of wilting even though it has been getting adequate water, this can also be an indication of trouble. Because laurel trees are so hardy, most Laurus nobilis diseases take some time to actually manifest as a serious health problem with the tree. In many cases, fungal infections can take months or even years to create serious problems. However, root rot can manifest in the first month or two of the problem and may affect the entire tree with wilt and even leaf fall. Finally, molds and mildews can cause cosmetic problems with your tree immediately, but do not usually cause the tree to actually die. Laurus nobilis can be susceptible to powdery mildew and black mold. These tend to grow on the leaves and branches of trees that do not get enough sunlight or that accumulate moisture on their leaves that does not evaporate quickly during the day. They are also susceptible to anthracnose fungal infections, which cause sunken, gray, mushy patches on leaves and branches that eventually develop spore masses. Root rot develops when the tree is planted in soil that is not well-drained, or when a fungal infection starts to rot away the roots of the tree and prevent it from taking up water and nutrients. Finally, insect infections, like sapsuckers, cause leaves to yellow, thicken and sometimes fall until the tree becomes weak and may succumb to another secondary illness. 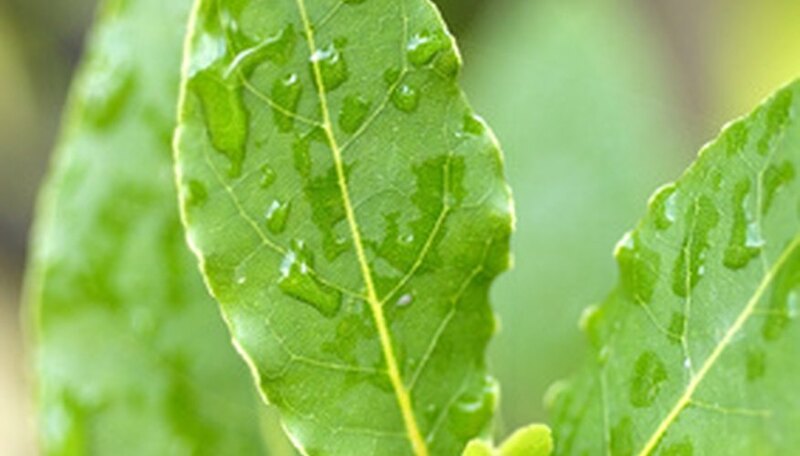 Because most Laurus nobilis trees are quite disease-resistant, you can usually get an infection under control with some careful, natural steps. However, all of these diseases can be effectively treated with pesticides or fungicides if you prefer. Just check with a local professional to make sure you are using chemicals that are considered safe and legal in your area. For anthracnose, mold and mildew, remove all affected foliage using sterile pruning. Dispose of all plant debris that you remove from the tree and that is lying under the tree in sealed bags. In most cases, this should enable the tree to contain the spread of infection naturally, although you will need to continue to monitor the tree for signs of continuing infection and removed impacted foliage as necessary. To deal with root rot, make sure that the soil is well-drained. Fumigate it if that is legal in your area to kill off the fungus, and stop watering the tree unless the soil is completely dry. If the leaves continue to wilt, then you may need to remove the plant to save the other trees in the area. Sapsuckers can be fought off with direct, under-leaf application of soap and water or the pesticide thiacloprid. Preventing most laurel tree diseases is fairly simple. Be sure to water early in the morning, using a drop hose rather than a sprinkler that will get the leaves and branches wet. Make sure that the tree is planted in sandy, well-drained soil and in partial to full sun. Keep branches pruned and thin enough to allow sunlight into the center of the tree. Clean up plant debris from under the tree on a regular basis to ensure that fungal infections to not have a chance to take hold in this location. What Are Diseases of the Sequoia Trees? What Causes Tree Leaves to Droop?